Ørkenfortet is a building block at Knippelsbrogade, Strandgade and Torvegade in København or Copenhagen, Denmark. The building pictured was until 1993 the adminstrative office of Burmeister & Wains. 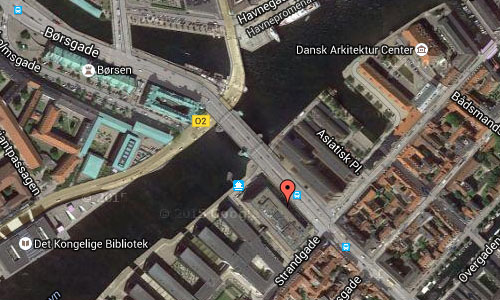 Since 1993, Nordea Bank has its offices here. the large administrative building, “Ørkenfortet” at Knippelsbro. 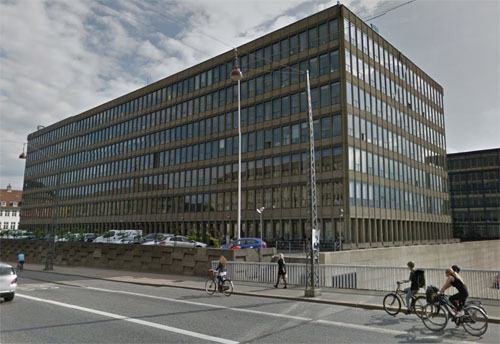 In 1980, the building was sold to Nordea, the same year when B & W was sold to the German industrial group MAN. Nordea entered the building for their head quarters from 1993. This building was constructed between 1957 and 1962. Architect was Palle Suenson. 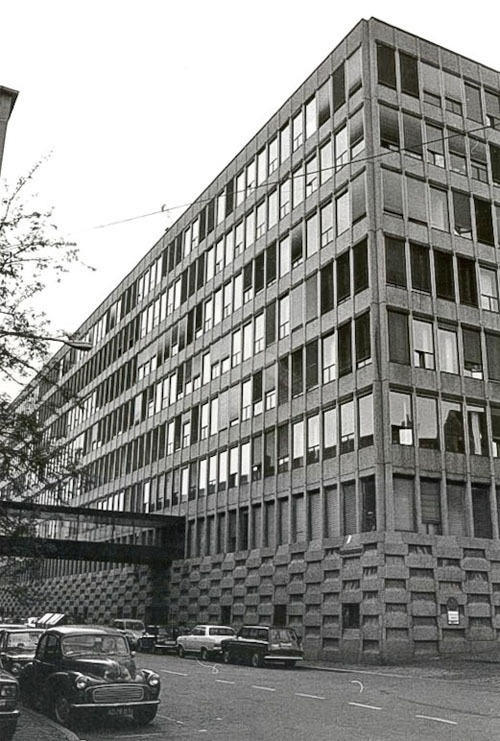 The building was B & W’s headquarters from 1962 to the early 1980s. Privatbanken, later Unibank and the current Nordea, has for many years had its headquarters here. 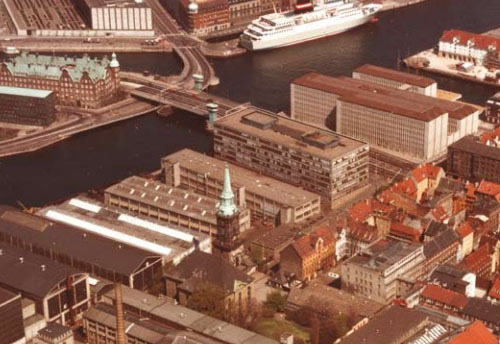 Burmeister & Wain was a large established Danish shipyard and leading diesel engine producer headquartered in Copenhagen, Denmark. Founded by two Danes and an Englishman, its earliest roots stretch back to 1846. 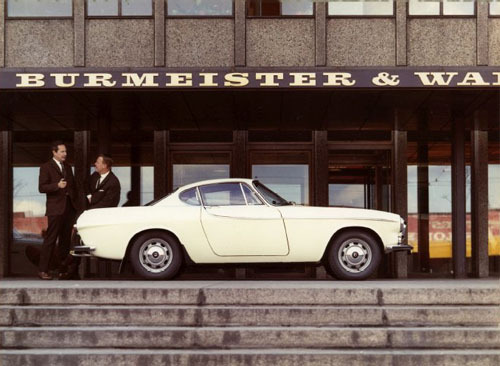 Over its 150-year history, it grew successfully into a strong company through the end of the 1960s. In the 1970s, global competitive pressures, particularly from the far east, began to take their toll. In 1980, B&W became MAN B&W Diesel A/S, part of MAN B&W Diesel Group, a subsidiary of the German corporation MAN AG, with operations worldwide. The company still maintains operations at three main sites in Denmark for manufacturing, servicing, and licensing of its two-stroke engines and complete propulsion systems. 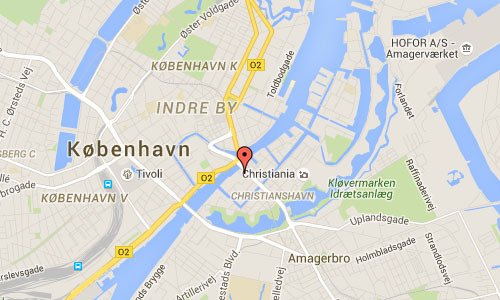 Christianshavn is a neighbourhood in Copenhagen, Denmark. Part of the Indre By District, it is located on the island of Amager and separated from the rest of the city centre by the Inner Harbour. It was founded in the early 17th century by Christian IV as part of his extension of the fortifications of Copenhagen. Originally, it was laid out as an independent privileged merchant’s town with inspiration from Dutch cities but it was soon incorporated into Copenhagen proper. Dominated by canals, it is the part of Copenhagen with the most nautical atmosphere. For much of the 20th century a working-class neighbourhood, Christianshavn developed a bohemian reputation in the 1970s and it is now a fashionable, diverse and lively part of the city with its own distinctive personality, with residents tending to see themselves first as Christianshavners and then as Copenhageners. Businessmen, students, artists, hippies and traditional families with children live side-by-side. Administratively, Christianshavn has been part of Indre By since 2007, but it still has its own local council.